Vagaries' Sunday Weekly Forecast for the week 26th Feb to 4th March. 1. A feeble W.D. F-4, will be passing over Northern most Pakistan on Sunday/Monday and over Indian States of Kashmir and H.P. on Monday/Tuesday. System will be weak and moving Eastwards fast. No effect over Nepal. 2. In Gujarat and interior Mah, days will rise slowly on Monday 27th Feb, thru Wednesday 29th, Possibility of Vidharbh region achieving the first 40c of the season around mid week. Steady temperatures in Sindh and Punjab regions of Pakistan including Islamabad, till Tuesday 28th. 3. N/NW winds will prevail over the NW region of India and Gujarat and coastal and interior Mah, areas on Wednesday/Thursday. A 2 day drop in temperatures to some extent (by 3/4c) will effect the NW, Gujarat and Mah. regions on Wed 29th and Thursday 1st March.. Fall in temperatures in Sindh and Punjab areas of Pakistan also these 2 days (Wed/Thurs). Day and night temperatures start rising from Friday 2nd March, again. 4. A prominent "High" remains dominant over the Arabian Sea throughout the week. Result, Westrly winds over Sindh Coast and Kutch. 5. No rains or effective system in South this week. But, a sharp rise in day temperatures from Tuesday seen over Northern and Coastal A.P. Possibility of 40c touching in Kurnool or Ramagundam mid week. So, the first 40c could be the case next week (mid week) either in Vidarbha or Northern A.P. In short, for almost all regions of the plains of the Sub-continent, a gradual rise in temperatures till Wednesday. Wed and Thursday will be cooler by 3/4c. 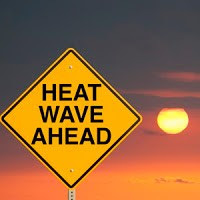 Again a shoot up from Friday reaching 40c in Vidharbha or A.P. Mumbai: No question of any major heat wave like last week. No chance pf a 39c again this week. I expect much less fluctuations in the coming week. Days will be a moderate and steady 33/34c at S'Cruz and 32c at Colaba almost thru the next week. Nights will be 17/18c initially till Tuesday morning at S'Cruz, and then around 19c thru the week. Slight clouding covering 20% of sky on Mon/Tuesday. Pune: South winds will keep Pune warm till Tuesday around 36c and 14c range. But Northern winds from Wed will cool down the temperatures to 32c and 12c on Wed/Thursd. Delhi NCR: Windy (NW) days will keep the days around 22/23c till Wednesdasy. A rise in day temperatures from Thursday, with the day rising to 31c by Friday. Nights too will start showing a rise from Wednesday and may go up to 14c from the current 10/11c range. Bharuch: A gradual rise in day temperatures from Monday to Wednesday. Days to rise to 35c . But a slight relief on Wed and Thursday as the winds turn NW. A drop in temps by 3/4c on these 2 days. Karachi: temperatures will be in the 28 -12c range till Tuesday. Strong Westerlies on Tuesday. Rise in day temperatures from Thursday reaching 31c by Thursday/Friday. Sukkar: Day temperatures will be slightly on the rise from the current 24 09 levels till Tuesday. Wed and Thursday will see a marginal fall in temps by 3/4c. Again, the rise starts from Friday with the day reaching 29c by next weekend . Kathmandu: Though it will be dry in the week, Not much rise from the current 27c is seen, and the lows would aslo be around 5c. Dubai gets rain on Sunday and Monday due to F-4. Night temperature dropping to 16/17c on Tuesday. Rising subsequently. Vagaries' last weekly forecast went quite "haywire" and was only 35% correct. erratic and unpredictable behaviour of F-3 was the main reason. That is 7 degrees above normal. by recording 38.2 c today and yesterday,,mangalore bajpe has recorded its all tym maximum temp record for the month of february!!!!! junaid: Manglore has touched its all time Feb high again..it was 38.2c on 19th Feb 1967 also.